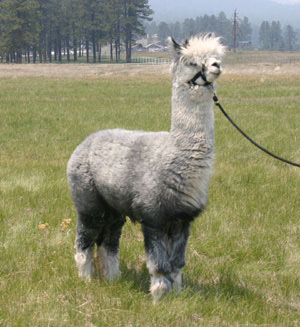 Plato is a General Schwarzkopf Son with award winning crias on the ground! One of the Longest Chilean Pedigrees in the U.S.
Plato's Sonnett is a lovely rose grey female with beautiful color markings. Sonnett has a playful personality, perfect conformation and a striking presence. Add to that her strong grey genetics, and you have a winning combination for your breeding program. Sonnett is a full sister to WMA Lyric (owned by Fleecy Dale Alpacas), who has won numerous blue ribbons and championships. We truly expect Plato's Sonnett to follow in her sister's footsteps! 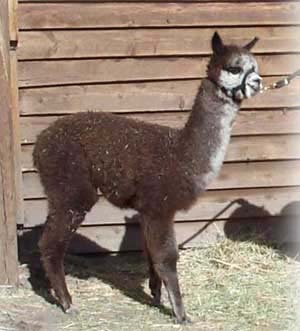 Aria is a beautiful dark rose gray female with perfect conformation and a very fine fleece with exceptional handle. 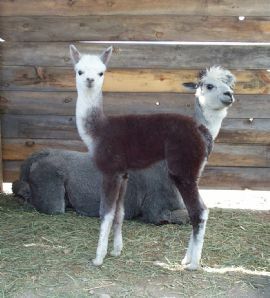 She was Plato's first cria on the ground and she carries the stature and color genetics of her sire's bloodline. SOLD! to Dana Vaughan of Prescott Valley, AZ. Lyric is Plato's second cria on the ground. She is a gorgeous silver grey female with strong conformation and incredible density and fineness in her fleece. Lyric had a very successful show career under her new owners, but is now retired from the ring. SOLD! 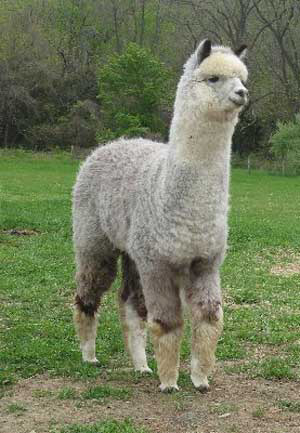 to John and Lauren LoVerde of Fleecy Dale Alpacas in Lambertville, NJ.